The word Tattoo comes from the Dutch term Doe den tap toe which literally means ‘Turn off the taps’. It dates from the seventeenth century when the British Army were fighting in the Low Countries (Belgium and The Netherlands). Drummers from the garrison were sent out into the towns at 21:30hrs each evening to inform the soldiers that it was time to return to barracks. The process was known as Doe den tap toe and encouraged the inn keepers to ‘turn off the taps’, stop serving beer and send the soldier’s home for the night. The drummers continued to play until the curfew at 22:00hrs. tattoo noun (pl. tattoos) 1. an evening drum or bugle signal recalling soldiers to their quarters. 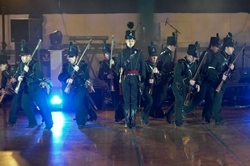 2. a military display consisting of music, marching, and exercises. [from Dutch taptoe, shutting off of taps, signalling the closing of taverns at the end of the day].